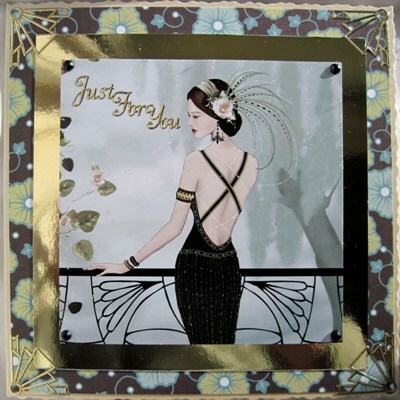 Art Deco-inspired handmade Birthday card 144mm.sq. cream, deckle-edged, has picture of elegant lady with feather headdress framed by gold mirri card and matted onto a lime and brown stylised floral background. 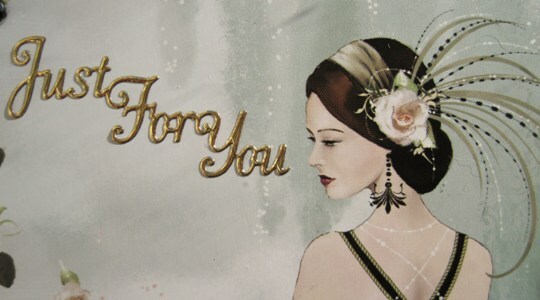 The words Just For You are embossed in gold, and it is finished with Art Deco gold corners. Ideal as a birthday card, thank you card or left blank for your own special message. Please choose options for the paper insert below. You can also add a different wording to the front if you prefer.